In the long term, the Canucks’ goaltending situation sets up quite well. Jacob Markstrom has proven to be a capable No. 1 goaltender this season, and is under contract until 2020. Thatcher Demko has made the jump from AHL to NHL, and will serve as Markstrom’s backup. Meanwhile in Utica, young Michael DiPietro will share duties with veteran AHL netminder Richard Bachman next season. The problem for Jim Benning and Canucks management is in the here-and-now, where a goaltending crisis of sorts has emerged. Vancouver lost Mike McKenna off waivers shortly after acquiring him from the Ottawa Senators last month. With Bachman already out with a season-ending injury, it meant the Canucks were flying without much of a safety net. Now Demko is out, spraining his knee before Monday’s game in Philadelphia. He’ll be gone about 10 days according to head coach Travis Green. DiPietro was brought in as an emergency recall, meaning there is now no room for error. The team will sink or swim with Markstrom, who hopefully won’t go down with an injury himself. The Canucks, who play six games in the next 10 days, are now one wrong turn from having to put their hopes on a 19-year-old goalie. Giving DiPietro spot duty at this stage of his career would be tough enough, never mind forcing him into a string of games. The situation is even worse in Utica, where the Comets are now relying on ECHL goalie Ivan Kulbakov to stop the puck. Kulbakov currently ranks 46th out of 50 AHL goalies in goals against average (3.48) and 36th in save percentage (.895). Recently, 37-year-old veteran Michael Leighton was brought in to help out. Both Kulbakov and Leighton are on AHL-only deals, meaning they can’t be brought up to Vancouver without burning a contract on one of them. For now, GM Jim Benning is doing nothing but crossing his fingers and hoping nothing else goes wrong, as the team clings to the final playoff spot in the Western Conference. 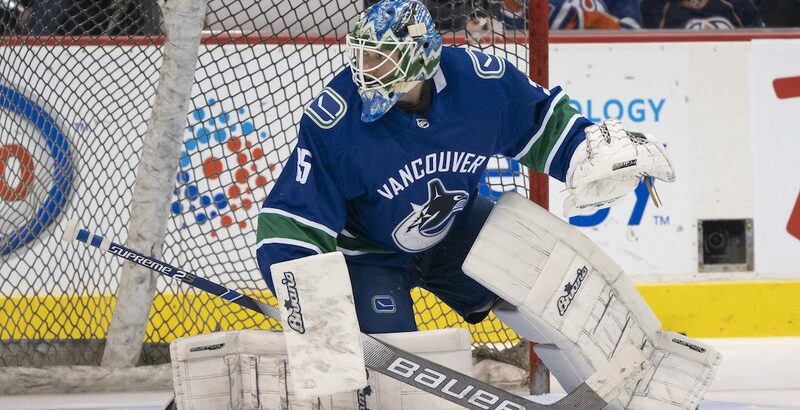 Expect the Canucks to snag the next goalie with a pulse that hits the waiver wire. That could be McKenna, who the Flyers are sitting on at the moment. Philadelphia currently has a stockpile of goalies, with Carter Hart, Anthony Stolarz, and McKenna active. McKenna accepted a conditioning stint with their AHL team, while Philadelphia monitors the health of Brian Elliott, who is nearing a return. Scott Gordon said there’s a chance that Brian Elliott could play next week sometime. When Elliott gets back, McKenna will be waiver-bound. The Canucks could trade for a goaltender, though giving up a draft pick to help fix a short term problem doesn’t make much sense. Perhaps swapping an AHL depth forward for a minor league goalie would be doable, but otherwise it makes sense to stand pat. Apart from the Flyers, there are a few teams that could be placing goalies on waivers in the near future. When Ryan Miller returns from injury – he’s been out with a sprained knee since December 9 – expect the Anaheim Ducks to move Chad Johnson. Miller returned to the ice recently, so that move could be coming soon. Same goes for the Vegas Golden Knights, who will likely place Maxime Legace on waivers once Malcolm Subban returns from injury. Legace, like McKenna and Johnson, is set to become a free agent on July 1. Until then, knock on wood or hold onto a lucky charm, because the Canucks might need it.